The debate on the benefits of trade has dominated this decade, and Africa has cast its vote for more and better trade with itself. In March 2018, African countries signed a landmark trade agreement, the African Continental Free Trade Area Agreement (AfCFTA), which commits countries to remove tariffs on 90 percent of goods, progressively liberalize trade in services, and address a host of other non-tariff barrier. If successfully implemented, the agreement will create a single African market of over a billion consumers with a total GDP of over $3 trillion. This will make Africa the largest free trade area in the world. What is less known about the AfCFTA is that its scope exceeds that of a traditional free trade area, which generally focus on trade in goods, to include trade in services, investment, intellectual property rights and competition policy, and possibly e-commerce. The AfCFTA is complemented by other continental initiatives, including the Protocol on Free Movement of Persons, Right to Residence and Right to Establishment, and the Single African Air Transport Market (SAATM). The scale of AfCFTA’s potential impact makes it vital to understand the main drivers of the agreement and the best methods to harness its opportunities and overcome its risks and challenges. The signing of the AfCFTA in Kigali comes at a time when the benefits of trade are actively contested, and global powers that traditionally promoted trade as a crucial driver of growth are now calling into question its very tenets. This apprehension is not without cause. It is broadly recognized that, while globalization and trade produced the impressive economic expansion of the past three decades, the gains have not been fairly distributed. The World Bank population-weighted Gini index shows that inequality rose steeply between 1988 and 1998 and declined only moderately by 2013. Although global poverty has fallen, prosperity has not been fully shared. AfCFTA will be a game changer for stimulating intra-African trade. Recent evidence by ECA shows that when African countries trade with themselves they exchange more manufactured and processed goods, have more knowledge transfer, and create more value. In fact, manufactured goods make up a much higher proportion of regional exports than those leaving the continent—41.9 compared to 14.8 percent in 2014. The real test of the AfCFTA, however, will be how quickly African countries can accelerate export diversification and product sophistication and make trade more inclusive. Trade diversification of exports is important as it allows countries to build resilience to movements in demand, due to economic downturns in importing countries but also price dips. In the case of commodity exporting countries it supports a shift from an over dependence on commodities to higher-value added products and services.3 Economic diversification allows for more inclusion of small and mediumsized enterprises and helps encourage innovation as more markets open. It is also productivity enhancing. Between 1990 and 2014, as most fastgrowing countries in the world diversified their economies, most African countries instead relied on rents from extractive industries. Figure 6.1 shows that, except for Rwanda, Senegal, and Sudan, African economies did not diversify their exports. 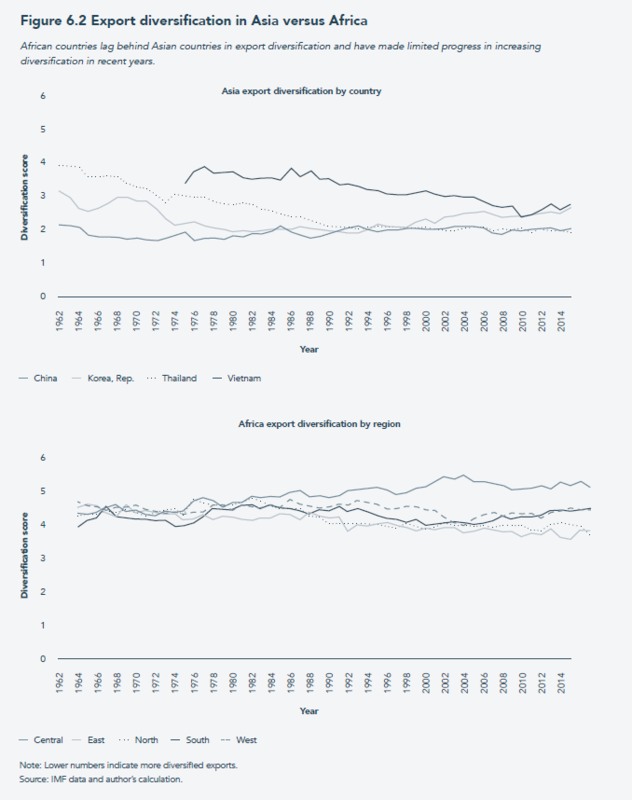 Export diversification for the continent improved only marginally between 1990 and 2014. Exports from Central and Northern Africa became increasingly more concentrated, and even countries with diversified exports like Morocco and South Africa lost ground. In contrast, most East Asian economies were able to diversify exports at a rapid pace and converge to the levels of China and Korea (Figure 6.2). Against this backdrop, the AfCFTA is expected to enable countries to break into new African markets as they both diversify by export destination and type of goods produced. The AfCFTA offers particular potential for agricultural products. In 2015, African countries spent about $63 billion on food imports,4 largely from outside the continent. ECA’s modeling projects that by 2040, the AfCFTA will increase intra-African trade in agricultural products by between 20 and 30 percent, with the highest gains in sugar, vegetables, fruit, nuts, beverages, and dairy products.5 The agreement is expected to expand access to markets at the regional and international levels, thus generating state revenue, increasing farmer income, and expanding both farmer and country capacity to invest in modernizing the agricultural sector through processing and mechanization. The AfCFTA as a result should stimulate demand for intra-African food imports, supporting a predominantly women-led sector. 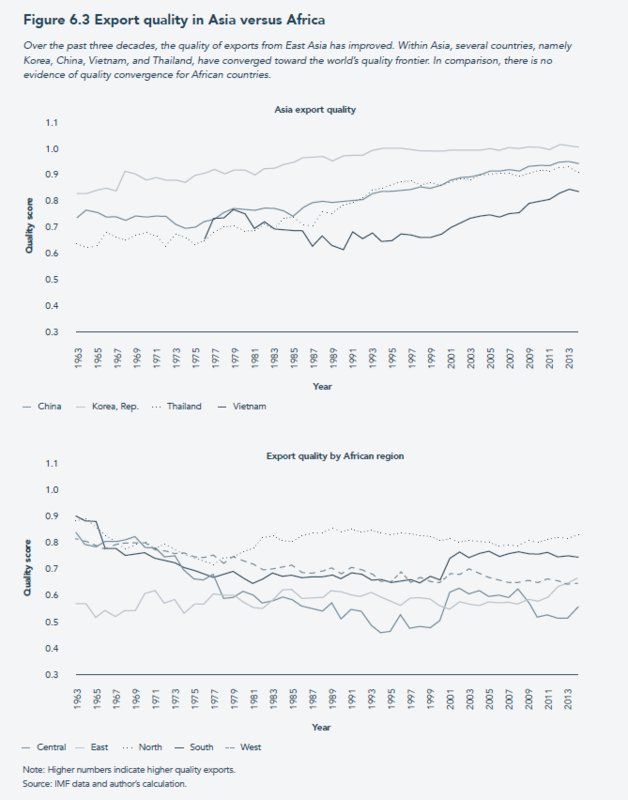 Over the past three decades, exports from East Asia have increased in both diversity and quality. Within Asia, several countries, namely Korea, China, Vietnam, and Thailand, have converged toward the world’s quality frontier largely as a result of integration in regional and global value chains (see Figure 6.3). The quality growth has been especially substantial in manufacturing, although the quality of commodities has also increased due to the development of vertically integrated industries. On the diversity criteria, African exports have generally lagged behind, and there is no evidence of quality convergence. The AfCFTA will improve export sophistication across the continent by enabling more countries to integrate regional and global value chains and consequently increase the quality of exports. When African countries trade with themselves they exchange more manufactured and processed goods, have more knowledge transfer, and create more value. At the regional level, Southern African economies have, on average, the most sophisticated exports. Botswana and South Africa export the most sophisticated goods while Rwanda and Uganda have made the greatest improvements over the past three decades. 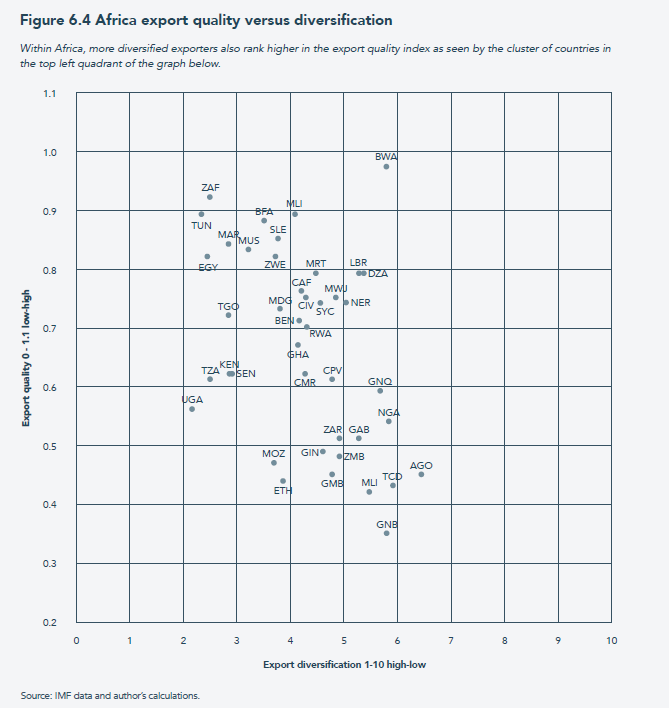 However, quality improvement of the export basket has been sluggish elsewhere, with some reversals, and there is considerable cross-country heterogeneity within regions. Analysis of sectoral quality shows that some richer and more open countries have well established manufacturing exports, such as South Africa and Morocco. Like the East Asian economies, they may have reached a saturation point to quality improvement within existing sectors and may need to target new geographic markets that can provide greater scope for growth and innovation to improve their competitive advantage. Other countries, such as Botswana and Mali, have successfully moved up the value chain within their natural resource sectors. 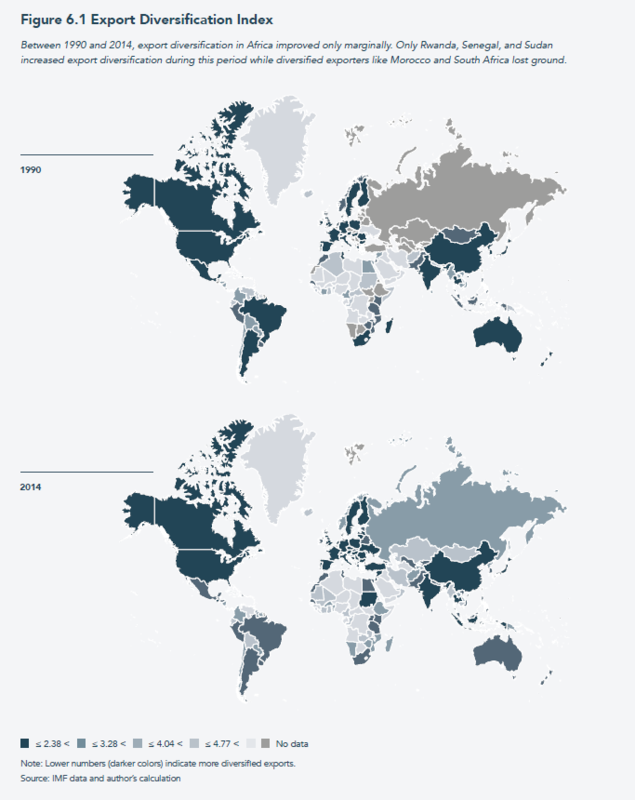 In these countries, knowledge transfers to other export sectors can unlock the potential of established or emerging industries. Differences in export performance and product sophistication demonstrate that across the continent there is potential for increased diversification, the creation of regional vertically integrated industries, and the development of globally competitive regional value chains. If the AfCFTA is to fulfill its potential in diversifying and transforming African economies in an inclusive manner, however, African countries must develop effective policies and strategies for exports, and identify new opportunities for diversification, industrialization, and value chain development. Furthermore, although the AfCFTA can address many important demand-side constraints to trade, particularly those linked to market size, supply-side constraints must also be addressed. ECA’s report on Bringing the AfCFTA About highlights that the AfCFTA potentially embodies a “win-win” approach such that all countries across Africa and vulnerable communities within these countries receive benefits from the agreement. However, to achieve this, the AfCFTA will require flanking policies and a strong focus on achieving tangible outcomes from its sister initiative, the Boosting Intra-African Trade (BIAT) Action Plan. BIAT offers a framework for addressing key constraints to intra-Africa trade and diversification under seven clusters: trade policy, trade facilitation, productive capacity, traderelated infrastructure, trade finance, trade information, and factor market integration. Particular attention should be attached to trade facilitation and building productive capacities. Trade facilitation is key to reducing non-tariff trade costs, and is important for ensuring inclusive benefits since landlocked countries and small, informal, and female traders are usually more burdened by inadequate trade facilitation. Additionally, building productive capacities through re-skilling programs will be crucial to ensuring that displaced workers and vulnerable persons are able to participate in welfare-enhancing African countries must develop effective policies and strategies for exports, and identify new opportunities for diversification, industrialization, and value chain development. 104 opportunities under the AfCFTA. In particular, Africans must be equipped with the skills needed to engage in skill-intensive manufacturing industries such as apparel and machinery. It is promising that African countries are already strategizing on how to benefit from the agreement and developing clear plans of action to take advantage of national, regional, and global markets in the AfCFTA context. The AfCFTA can play a game-changing role in Africa’s economic diversification and inclusion. This is not an opportunity to be missed and 2019 will be a defining year. United Nations Economic Commission for Africa. 2018. “An Empirical assessment of AfCFTA Modalities on Goods.” UNECA. United Nations Economic Commission for Africa. 2015. “Industrializing through Trade: Economic Report on Africa 2015.” UNECA. Songwe, Vera, and Deborah Winkler. 2012. “Exports and Export Diversification in Sub-Saharan Africa: A Strategy for Post-Crisis Growth.” Brookings Institution. Agra. 2017. “Doubling Productivity and Incomes of Smallholder Farmers in Africa.” AGRA: Growing Africa’s Agriculture. August 23, 2017. https://agra.org/doubling-productivity-and-incomes-of-smallholder-farmers-in-africa/. United Nations Economic Commission for Africa. 2018. “An Empirical assessment of the African Continental Free Trade Area Modalities on Goods.” UNECA. Hausmann, Ricardo, Jason Hwang, and Dani Rodrik. 2006. “What You Export Matters.” Journal of Economic Growth12 (1): 1–25. https://doi.org/10.1007/s10887-006-9009-4.